When you miss a couple of putts, it's easy to get hung up on technique. Should I take it back straighter? More inside? Open the face? This type of attention is ultimately a distraction, causing you to focus more on the putter head and less on the object you are propelling; after all, in the full swing and all other ball sports, you just watch the ball. Ultimately, it robs the stroke of the flow and rhythm it needs. So to kill off this over-awareness of the blade, grab a scorecard and two tee pegs and head to the practice green... and try a drill that encourages you to let the mechanics of the stroke look after themselves. Stick the two tee pegs through the scorecard – then push them into the ground to leave the card a few inches off the ground, as shown. Make sure the tee pegs are long enough to leave room for the ball beneath the card. Position the ball so the card is completely blocking it from your view, but close enough to the edge of the card to allow for a centred strike. Take your putter and set up as you would normally, with your eyes over the card and the putter's hosel near its edge. Go ahead and strike the ball. With the blade hidden from you, the impulse to manipulate and control it is removed. 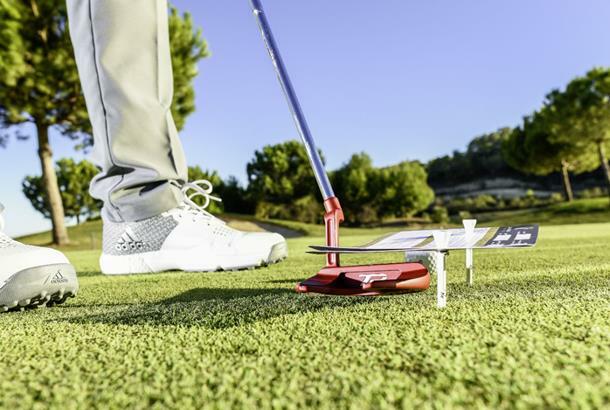 You will simply move the putter forward through the ball, allowing the ball to get in the way. It may take a couple of goes for you to strike the ball from the sweet spot, but you will instantly feel how with the sight of the blade removed, you are able to make a much calmer and more fluent move through the ball. Hone the feeling before removing the card. It's going to lead to a much better roll, and more putts holed.